The 2016 Toyota Sequoia – equipped with technologies that maximize power, efficiency, vehicle control and capability – is the full-size SUV that delivers full-sized adventure for seven or eight adults, plus an impressive amount of available cargo space. Tow, cruise or haul: the Sequoia does it all. “The Sequoia is the full-size SUV that only Toyota could build – delivering the perfect combination of capability, durability and safety – plus a full-sized range of premium comfort and convenience features,” noted Larry Hutchinson, Vice President of Toyota Canada Inc. Maximum capability starts with maximum performance, which is why every 2016 Toyota Sequoia is built around a powerful yet efficient 381 peak horsepower 5.7 L i-FORCE V8 that generates up to 401 lb-ft of torque. Dual Variable Valve Timing with intelligence, crank hold electronic starter control, Acoustic Control Induction System are just a few of the systems the Sequoia uses to maximize power and efficiency, while the battery, starter, alternator and heater are all heavy-duty models designed for durability and reliable performance – even in the harshest winter conditions. This powerful engine is mated to a six-speed automatic Super ECT sequential shift mode transmission with a dedicated transmission cooler plus transmission fluid warmer. Power is delivered to the wheels via one-touch, on-demand four-wheel drive with an automatic disconnecting differential, centre differential lock and auto-limited slip rear differential for seamless, on-the-fly shifting between rear-wheel-drive and four-wheel-drive. Every Sequoia is standard equipped with a tow package, featuring a heavy duty tow hitch receiver, 4 and 7 pin electrical connectors, trailer brake controller prewire, and more, giving the Sequoia a towing capability of at least 7,000 lbs. The Sequoia’s suspension system provides a comfortable ride with front and rear suspensions featuring independent double-wishbone systems with shock absorbers, coil springs and stabilizer bars, and a trailer sway control systems provides additional stability when towing. Special underbody plates also protect the engine and transfer case from hazards when adventure takes you off the beaten path. Safety is always standard on a Toyota, so every Sequoia features eight airbags, anchor points for child seats, child protector rear door locks, a back-up camera, and a direct tire pressure monitoring system. As with every new Toyota since 2011, the 2016 Sequoia is also standard equipped with the six active safety technologies of the Star Safety System: Antilock Brake System, Brake Assist, Electronic Brake Force Distribution, Vehicle Stability Control, Active Traction Control and Smart Stop Technology work together to help drivers avoid potential accident situations. Every Sequoia is generously equipped with comfort and convenience features, including: Audio systems with USB audio input, Bluetooth capability, integrated XM Satellite Radio and steering wheel mounted audio controls, three-zone independent automatic climate control with air conditioning and steering wheel-mounted HVAC controls, a 10-way power adjustable driver’s seat and four-way power adjustable front passenger seat, heated front-row seats, third-row 60/40 split fold-flat rear bench seat, a conversation mirror, auto-dimming rear-view mirror with integrated compass and backup camera, power door locks with keyless entry; power windows with front row auto up/down function and power tailgate window, running boards, roof rails and crossbars, a power moon roof, headlamp washers; fog lamps and more. The eight-passenger Sequoia SR5 features: An eight-speaker 6.1” Display Audio system, leather seat surfaces, a second-row 40/20/40 split fold-down bench seat, leather wrapped steering wheel, cruise control, automatic headlamps, headlamp washers, anti-theft system, integrated garage door opener, auto dimming rear view mirror, 18” aluminum alloy wheels with locks, and more. The eight-passenger Sequoia Limited 5.7L builds on the SR5 grade adding: A 12-speaker audio system with SMS-to-speech and email-to-speech, driver seat memory system, Optitron instrumentation and a multi-information display, blind spot monitor, power tilting/telescoping steering column, power rear door with jam protection, rear door sunshade, tonneau cover, power tailgate lock, 20” aluminum alloy wheels with locks, power folding exterior mirrors with integrated signals, reverse auto-tilting heated exterior mirrors linked to driver’s seat memory system, chrome exterior accents, rear spoiler and more. The Sequoia Platinum 5.7L builds on the Limited 5.7L grade accommodating up to seven adults with second-row captain seats, plus many premium comfort and convenience features, including: A 14-speaker JBL Synthesis Audio System, and integrated navigation system, a rear seat entertainment system with remote control, 9” LCD monitor and two sets of wireless headphones, heated and ventilated front-row seats, heated second-row captain seats, dynamic laser cruise control, woodgrain and leather wrapped steering wheel, interior woodgrain trim, unique 20” aluminum alloy wheels with locks and more. The 2016 Toyota Sequoia is now on sale at Toyota Dealers across Canada. 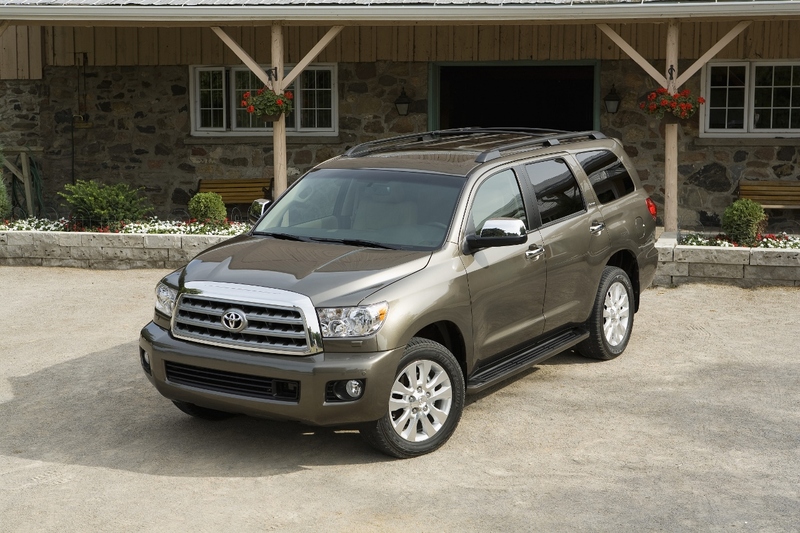 For more information on features and specifications, visit www.toyota.ca/sequoia. This article has been imitated from Toyota Canada’s News Room. See the original article here. Every effort has been made to ensure the product specifications, equipment, and content on this site are accurate based on information available at time of publishing. In some cases, certain changes in standard equipment or options may occur, which may not be reflected online. Toyota Canada reserves the rights to make these changes without notice or obligation.